The Boston Bruins are not having a very successful 2014-15 season to this point by their standards. A lot of this can be pinned down to injuries but a fair amount also needs to fall on the doorstep of Bruins GM Peter Chiarelli. It is almost to the half-way point in the season and the Bruins are sitting outside of the playoffs (albeit by only one point) but it has been years since they have been in this situation. Just last year they were the big dog in the Eastern Conference. How did they get here? Anytime you combine injury issues with a team close to the cap ceiling you are going to have to ride out those injury problems with limited ability to bring in reinforcements. Losing Zdeno Chara for a large stretch of time is going to hurt any team, regardless of their cap management. However, the bigger concern is that the Bruins as currently constructed are not positioned well moving forward. They have made some dubious trades and there is one that is specifically going to haunt them now and into the future. That trade of course is the one that involved Tyler Seguin. It is obvious that trading Tyler Seguin away will go down as an all-time blunder. He is a budding superstar in the league now. The Bruins got away with trading Joe Thornton and Phil Kessel, they won’t be as fortunate with Seguin. Instead of dealing with the perceived issues with his life away from hockey the team jettisoned the young Tyler Seguin off to Dallas and forced their own hand with David Krejci. Krejci signed a massive six year 43.5M extension. Ultimately the Bruins chose Krecji over Seguin and they will pay more and get less because of it. The Bruins can’t undo the Seguin trade but they can start to think about how to open up cap space moving forward. The Bruins have already had to sacrifice such players as Johnny Boychuk and Jarome Iginla because of their cap concerns. With Reilly Smith, Torrey Krug, Carl Soderberg, and Dougie Hamilton all up for new contracts next year the money will have to come from somewhere. A prime candidate to move after analyzing production value versus cost would be Milan Lucic. Depending on who you talk to Lucic is either the quintessential power forward/deterrent that every team needs or an overpriced player whose toughness does not make up for the lack of production for the cap hit. I happen to think that his 6.0M cap hit can be spent better elsewhere. Seguin is trending up while the other two are trending down. 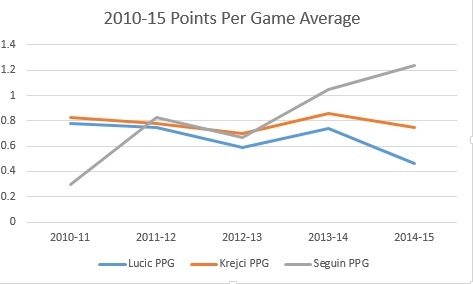 Krejci and Lucic may be able to turn things around but don't expect Seguin's production to slow down in the near future. Dallas gave him the opportunity to play at his natural position of center and he is never going to look back. 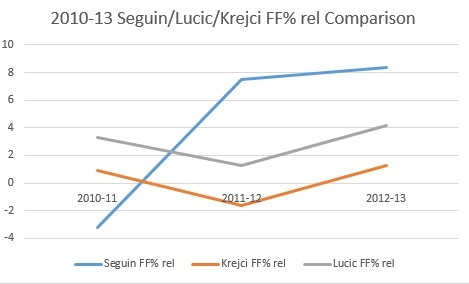 Lastly, here are the financial implications from the choice to go with Krejci over Seguin. Seguin is younger and better than David Krejci and will cost 2.0M less per year. You can’t change the past but now that the the Bruins will get less value at the center position than what they could have they will have to look towards freeing up money by dumping another contract. The most obvious candidate is Milan Lucic. The Bruins will need to shed some salary and hope that they can get some impact players on ELC’s to get back to being one of the best teams in the East. If they can’t they will find out what the Penguins found out, it ain’t easy to stay at the top without maximizing your cap space with good investments. There is very little margin for error when you are at the top.